You can manage computer and user resources within a System Center 2012 R2 Configuration Manager environment only when Configuration Manager has discovered these resources and assigned them to a site. In this post , you will learn about boundaries and boundary groups that help create logical network locations that contain discovered computers based upon IP addresses or Active Directory® sites. You can use these boundary configurations for client site assignment and for helping clients find content from associated site systems. You also will learn about the discovery processes that you can use to identify computers, users, and the network infrastructure within your network environment. You then will learn about collections that support logical groupings of resources. You use these groupings for management tasks such as targeting software updates, managing applications, or deploying compliance settings to resources. must install the client software on that computer, and the computer must join a primary site. subnet IDs. You can be very specific about each network location. However, frequent IP subnet changes or additions require additional boundary administration, such as moving a site to another site manually. maintaining network locations. 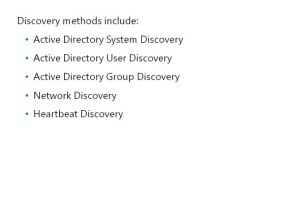 Active Directory administrators create Active Directory sites, which typically represent distinct network locations. One main advantage for using Active Directory sites for Configuration Manager boundaries is that any subnet changes to the Active Directory sites are reflected within the boundaries automatically. However, one disadvantage is that you must rely on the proper configuration of the Active Directory sites. If the Active Directory administrator has not configured the site settings properly, you may have unmanaged clients within the improperly configured subnets or clients assigned to the wrong Configuration Manager site. • IPv6 prefix. You can use this boundary type if your network infrastructure uses IP addresses based upon the Internet Protocol version 6 (IPv6) architecture. This supports the current and future operating systems that rely on this IP addressing method. • IP address range. You can use this boundary type if you need to be very granular when specifying clients. You can use a range to specify a single client for testing purposes, or you can add a range of client addresses to represent any number of client devices. This method requires careful planning and administration to ensure that the IP ranges are not used as part of an IP subnet or another site’s Active Directory site-boundary configuration. Configuration Manager boundaries are global, and each boundary definition is available from every primary site, secondary site, and the central administration site, within the hierarchy. A boundary itself does not enable client management at the network location. You have to add a boundary to a boundary group before the clients can be assigned to a specific site automatically or access content within a specific boundary. To configure boundaries, open the Configuration Manager console, right-click the Boundaries node, and then select Create Boundary. The Create Boundary dialog box provides an option to select one of the four boundary types and configure the related settings, as necessary. • New-CMBoundary. Use this cmdlet to create a new boundary. • Get-CMBoundary. Use this cmdlet to view an existing boundary’s information. • Set-CMBoundary. Use this cmdlet to alter an existing boundary’s properties. create custom queries and organize resources into collections that you can use for management tasks, such as software deployments. When Configuration Manager discovers resources, it creates discovery data records (DDRs) that it submits to the Configuration Manager database. Each generated file has a DDR extension, and the specific information that each record contains varies depending on the resource that Configuration Manager discovered and the discovery method it used. However, records can include data such as the NetBIOS name of a computer, IP address and IP subnet of a computer or device, operating system, and media access control (MAC) address. The Discovery Data Manager component loads the discovered data from the DDR file into the site database. 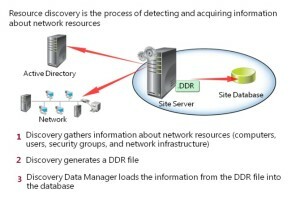 Depending on the configuration of the discovery method used, resource DDRs are regenerated periodically to update the discovery data and to verify that each resource is still a valid resource within the Configuration Manager site. replication and then entered into the database. Then, Microsoft SQL Server® database replication replicates the discovery information throughout the hierarchy’s primary sites. However, DDRs for known resources are processed at the primary site and are then replicated to the central administration site by using database replication. After a discovered resource becomes a client of a specific site, the discovery information is no longer replicated between other primary sites throughout the hierarchy. If a resource’s discovery data is not updated within a specific amount of time, a site-maintenance task called Delete Aged Discovery Data will remove the resource’s data from the database. This task is, by default, configured to delete data older than 90 days. You can modify this site-maintenance task in the Administration workspace by expanding the Site Configuration node, clicking the Sites node, rightclicking the site name, and then clicking Site Maintenance. Configuration Manager provides five configurable methods that you can use to discover network resources. Each of these methods returns a different set of discovered resources. 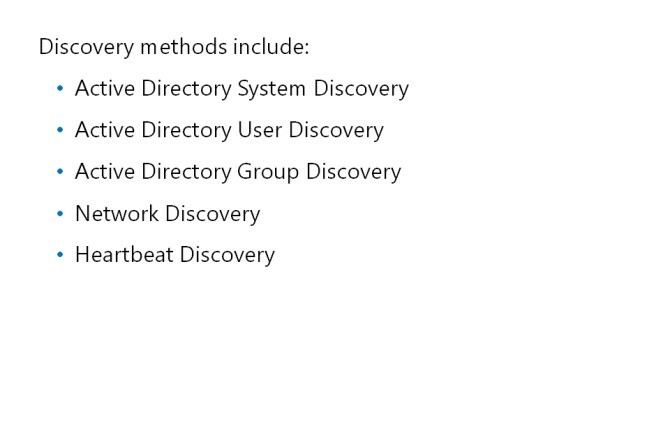 Each of the discovery methods, except Heartbeat Discovery, is disabled by default.